When travelling, we see unusual sights, sleep in unusual places, and eat unusual food. Tourists observe and move on. Travellers also observe, but they compare and compute, they scratch at the surface and are keen to understand where they find themselves. Travellers are looking to understand cultural and societal difference but also to see what unites us. Of the three essentials in life, shelter, warmth and sustenance, the last is maybe the most pleasurable. Learning how a culture feeds itself lifts the lid on to how a society functions, and from this premise the Fez cooking School was born. In Morocco, markets full of seasonal local produce, those things that we are now creating political organisations to maintain in the west, is still very much the natural way of doing things. Meals are cooked freshly and daily, people stop what they are doing for lunch and supper, and there is always something for the unexpected guest. Food is traditionally served in a single central plate generally sauce based, and eaten by sopping up the dish with freshly baked bread. Anyone dropping in is welcome, there is always enough to go round, even if the amount of meat in the dish is minimal or replaced by pulses. To keep budgets to a minimum and in a country where not every household has a fridge, going to the market daily is not at all unusual. The meals or meal of the day will be determined by what is fresh and good value in the market. 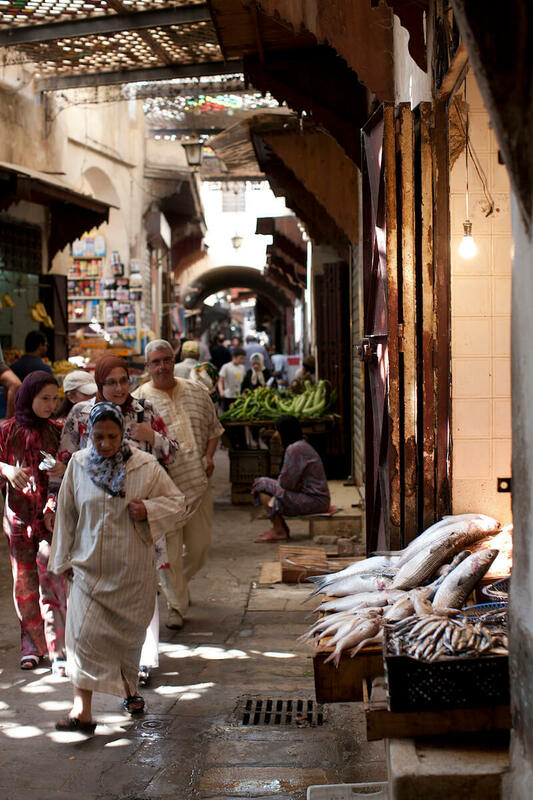 The starting point of a cooking workshop is in the markets of the medina or the souks as they are called. Here the ingredients of the class are carefully chosen by you and the chef and as you serpent around the narrow streets and alleyways, you have a first hand view of what daily shopping means. It’s a serious business, highly animated and vocal. Once the shopping is over, and a number of dishes tasted on the way, you go back to the more peaceful surroundings of the Fez Cooking School that is situated at Palais Amani, a boutique hotel just inside the walls of the ancient city. There you will learn how to make some of the dishes that Moroccan cuisine is renown for in a hands on workshop with the chef and members of the Fez Cooking School. You round off your experience with a lunch or dinner that you will have concocted sitting on the rooftop or in the luxuriant gardens below. Not all of us are expert chefs, and cooking for some can be a challenging business, but we guarantee that your meal will be delicious and the experience will stay with you well beyond the feeling of contentment at the end of your meal.